Mason bees are a solitary bee (unlike honeybees that live in colonies) that are known for their excellent pollination abilities. They are ‘kept’ or more accurately cultivated by people who want pollinators for early blooming crops like fruit trees. Mason bees look more like a fly than a bee if you don’t look closely. They’re black and smaller than a honey bee, but they do have stripes (just not as visible as other kinds of bees) and a characteristic bee shaped body. Female Mason bees make their nests in holes and can be attracted to an area by hanging up mason bee houses for them to nest in. These houses can be made easily and inexpensively as well as purchased commercially. Mason bees love holes, cracks and other dark places to lay their eggs. If you provide an appealing solution for their egg laying needs, they might very well take you up on the offer to live there. Below is a video showing two mason bee houses and the bees flying in and out of the house. So what if you can attract them to lay their eggs around your property? What difference does it make? Mason bees are about 100 times better at pollination than honeybees. They’re early pollinators so they help to pollinate all the early flowers and fruit trees before other bees kick into high gear. Adding a diverse mix of bees to the pollination of gardens and crops greatly enhances a more thorough pollination. Mason bees seem to be resistant to many of the diseases that are threatening the honey bee population. Maybe you’ve thought about honey bees but don’t have the time nor money to get into bee keeping (or worry about getting stung). Mason Bees are a much lower entry point with both time and money. Mason bee houses can be built from scrapes and virtually cost nothing. 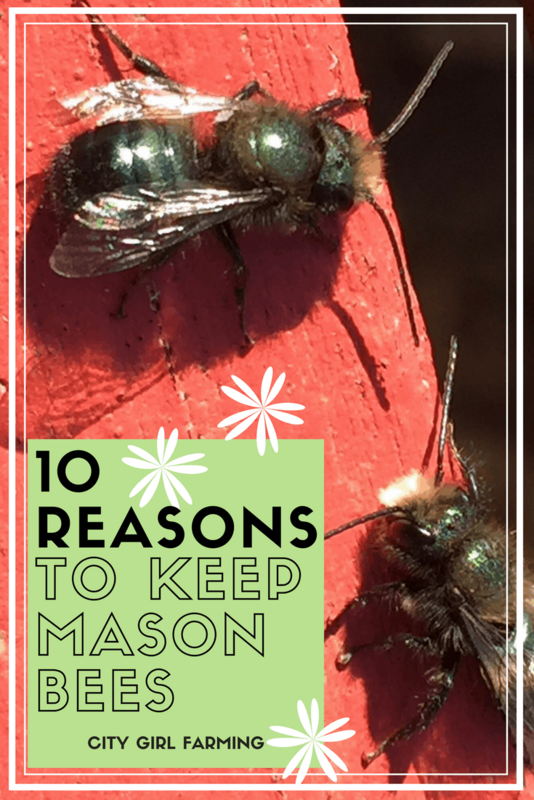 Because there are no hives to protect (and no honey stashes), killer bees and other unwanted pests won’t be trying to invade your Mason bees. You won’t have to worry about the possibility of swarming because they don’t live in colonies and operate like honeybees. Mason bees don’t sting–unless you smash them (as in literally). Mason bees don’t require medications and supplements to keep them alive. You don’t have to tend to them throughout the year or make sure they get enough food to winter them over. The female bee takes care of what her eggs (and hatched out bees) will need to make it through to spring when they emerge. They’re pretty much 100% benefit with almost no care taking. Really, there aren’t too many disadvantages …unless you’re wanting honey. Mason bees aren’t honey producers. Short of that, though, they’re pretty perfect!